Without question the kitchen is the most important room in the house. It used to merely be the room where we prepared meals but now it has become the social hub of our home and probably the most used room. Because of its importance, it’s no surprise that kitchen remodeling is one of the biggest industries in design. And everyone wants their kitchen remodel to have the most popular styles. Here are some 2018 kitchen trends that you would be wise to include in your remodel. In 2018 we can expect to see bold, vibrant colors. Every year Pantone LLC puts together a group of colors that are expected to be used in fashion, interior design, and many other industries. And this year’s colors are loud and vivacious. For example, the 2018 Pantone Color of the Year is Ultra Violet or Pantone 18-3838. You will be seeing this fun shade of purple in many industries throughout the year. Throughout history there have been many decades where only one or two metal finish have been popular. For example, brass was a popular metal finish in the 1990’s or copper and gold finishes were popular in the 1960s’ mid-century modern designs. In contrast, 2018 kitchen remodels are including multiple metal finishes. According to interior designer Rachel Grace, “a beautiful mixed-metal kitchen could feature copper sconces and pendants, oil-rubbed bronze pulls and hinges, and a faucet and pot filler in polished nickel.” Mixing your metal finishes allows you to have all the finishes you like and is a lot more interesting than the typical matching finishes of the past. With the increasing popularity of the “go green” movement, it’s no surprise that there is also an increased movement for including natural materials into your kitchen remodel. Wood is one of our best renewable resources for kitchens and can be used in lot of ways including wood flooring, natural finished wood cabinets, and even butcher-block countertops. Other examples of natural materials include stone countertops and brick or stone backsplashes. Quartz is an emerging trend for kitchen countertops in 2018. Quartz is a manufactured stone but can be just as beautiful as your natural granites and marbles. In fact, because it is a man-made material, the range of colors can be a lot more varied than what is found in natural stones. Other reasons quartz is a good choice for countertops are its superior durability and stain resistance. 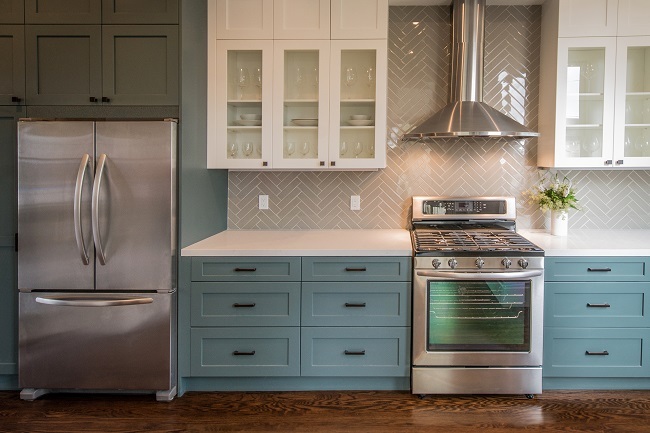 Due to its durability and moisture resistance, tile has been the dominant flooring and backsplash materials in kitchen and bathrooms throughout history, and that trend isn’t about to change. But you won’t find the simple 12″ x 12″ square floor tiles or the basic white subway tile in your kitchen today. A popular trend for flooring and backsplashes in 2018 is tiles with interesting textures and shapes. Modern kitchen floors are often tiled with larger, more rectangular tiles or flooring laide in an interesting pattern such as the chevron. And tiles with metallic tones, different shapes like hexagons, or heavily textured tiles have become popular choices for backsplashes. Contact us to let us know how we can help you to include these 2018 kitchen trends in your new kitchen remodel and ensure your kitchen will be right on trend.